Topics: Background, Predictions, and Highlights. 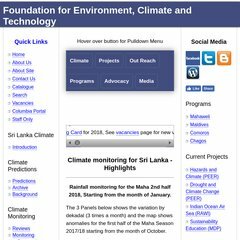 climate.lk Climate Change, History, Monitoring, Predictions and News in ..
climate.lk Colombo Observatory Takeover - Climate Change, History, Monitoring .. It is hosted by Server Farm Colombo, using Apache/2 web server. It has 3 DNS records, s2.ns.slt.lk, s1.ns.slt.lk, and p1.ns.slt.lk. PHP/5.1.6 is its coding language environment.